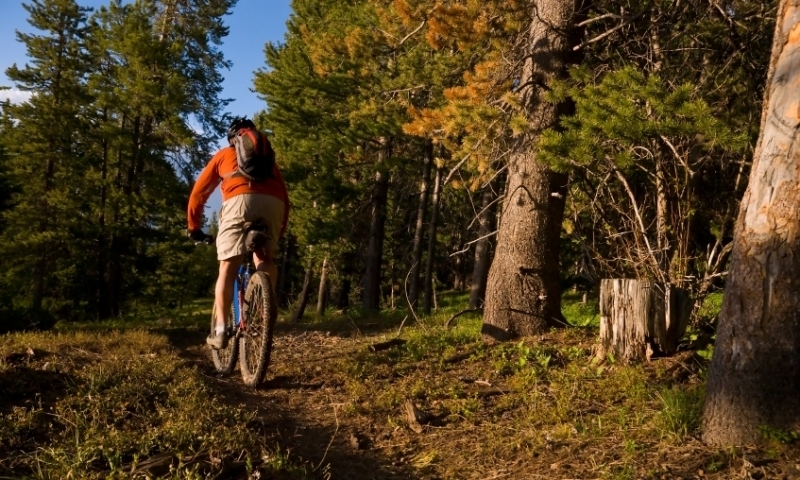 Surrounded by the Deschutes National Forest and high desert country, Bend’s location in beautiful Central Oregon makes it a great place for both mountain biking and road biking. With over 25 years of service, we're ready to outfit you with anything you may need to pedal, cruise, ski and paddle Sunriver and Central Oregon. Carrying all tools for mountain biking to keep bikes running at their best. Name brand and expert employees. We want to help you get out of your car and see Bend on bike! Visit our shop to see practical bikes born in Bend, OR. Golf resort located in central Oregon. Multiple golf courses, as well as tennis courts, bike trails, fishing and swimming. Offers vacation homes, from rustic cabins & homes. Cog Wild is Bend's local guide company for beginner to expert level mountain biking in Central Oregon and shuttle to the famous McKenzie River Trail and local Bend trailheads. Appearing much like a trolley with a twist-riders provide the horsepower by pedaling this passenger “bike” while enjoying the various sights and attractions of Bend! Bike stores in Bend, Redmond and Klamath Falls – Central Oregon’s Premier Cycling Shop for Sales, Rentals and Service since 1927! We Deliver Fun! Rental bikes quickly brought to your Hotel or Vacation Rental....free delivery and pickup! Helmet and lock included. A Downhill Waterfall / Mountain Bike Tour! 6 natural waterfalls and 2 natural watersides will cool you off during your bike downhill. Store featuring products for mountain sports and outdoor activities. Rentals available for summer and winter, great prices. Bend's best bet for cycles. Specializing in bike sales and repair, come try out one of their many demo bikes before you buy! Love to bike and ski? Sunnyside Sports Inc offers the best selection of biking and skiing gear in Bend, Oregon. SEGWAY and Bus Tours of Bend Oregon along along the magnificent Deschutes River through Bend’s beautiful Parks and throughout the Old Mill District. Located near the spectacular Cascade foothills of Oregon, this is the ultimate destination for outdoor enthusiasts with snowboarding, skiing, hiking, rock climbing and more. Just about everything you could want that has wheels for your enjoyment. Mopeds, bikes, tandem bikes, surreys, electric hummers, and more. In and around Bend, mountain biking is a popular summer activity. Enjoy breathtaking views of Crater Lake while cycling the 33-mile long Rim Drive. Mountain bike through the beautiful Cascade Lakes on the 23.5-mile Sparks Lake / Lava Lakes Trail. Be sure to purchase a recreation pass before riding certain trails. From late spring through early fall, mountain biking and road biking are popular activities in Bend and the surrounding area. Bend, Oregon biking enthusiasts have no shortage of scenic trails and roadways to explore as they wind through national forests, lush meadows, and designated wilderness areas. Towering Cascade peaks, lava flows, sparkling lakes, unique rock formations, flowing rivers, and beautiful wildlife make Bend, Oregon cycling a memorable experience. Some trails require a recreation pass, so be sure to check before you start your ride. Crooked River National Grassland – Mountain bikers can ride for hours on trails that wind through this 155,000-acre grassland northeast of Bend, Oregon. Mountain biking trails include the Cole Loop trail, which is a challenging 25-mile ride, and the Warner Loop trail, which is just 10 miles. Cove Palisades – The Cove Palisades Cruise is a popular route for avid road bikers. Just over 51 miles in length, this loop northeast of Bend offers cyclists incredible views of Lake Billy Chinook and the Crooked River Gorge. Sparks Lake – The challenging 23.5-mile Sparks Lake - Lava Lakes trail offers beautiful views of the Cascade Lakes. It consists of 13.5 miles of pavement and 10 miles of dirt single track. Sunriver - The Sunriver to Benham Falls Trail is an easy, 4.3 mile trek for mountain bikers, comprised of dirt road most of the way. Crater Lake – Many avid cyclists ride the challenging 33-mile Rim Drive at Crater Lake each year. Suitable for experienced bikers only, this two lane road has steep hills, rocks, and a lot of traffic during the summer. The views from the road are breathtaking, making the ride worth the effort. There is also an 8-mile, unpaved road known as Grayback Drive, which is perfect for mountain biking. Cultus Lake – Mountain bikers can choose from many trails near this beautiful alpine lake, including the mostly single track Cultus Lake Loop which is 12 miles long and has an elevation gain of 780 feet. Smith Rock State Park – Just a few miles northeast of Bend, this park known for world-class rock climbing also boasts several miles of mountain biking trails, many of which offer spectacular views. The 11.1-mile challenging Burma Road trail offers a 2000-ft elevation gain. Davis Lake – Mountain bikers enjoy the beautiful scenery near this lake as they ride along the Moore Creek Trail, which is 7.5 miles long, and the Maiden Lake Trail, which is 6 miles long. As you plan your Central Oregon mountain or road biking adventure be sure to take some time to check out the biking guides and outfitters listed on this web page.